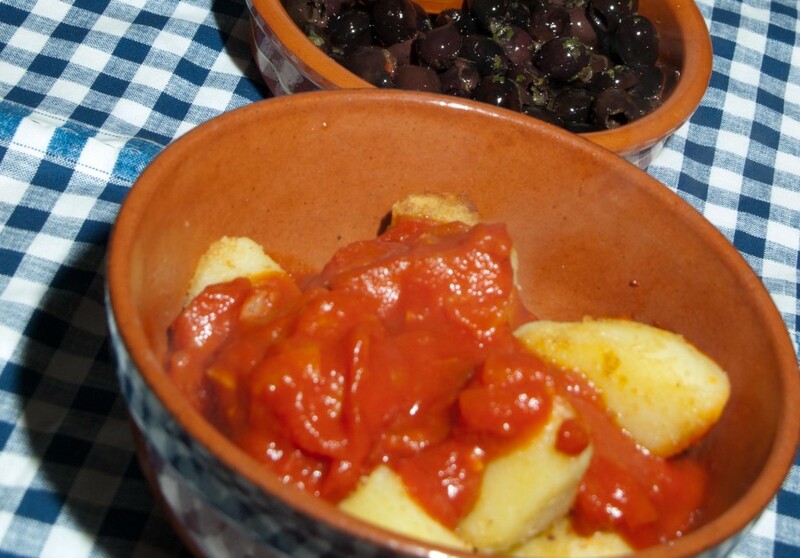 This recipe is for Patatas Bravas which is a “hot” favourite of my daughters. The chilli adds a fiery zest to the sauce and is a perfect complement to the crispy, fried potatoes. 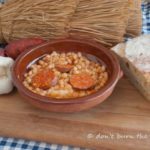 The first recipe below is our family version of the classic Spanish dish often served in bars as a tapa. Although a relatively quick dish to prepare, I have developed my own short cut version included below. 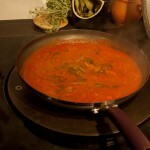 Pour half the liquid from tinned tomatoes into a pan and heat to reduce and thicken. Peel and chop onion and garlic and set aside. Peel and chop potatoes into cubes and fry in oil until cooked. Drain on some kitchen paper and set to one side. Heat some olive oil in a pan and add chopped onion, tomatoes and garlic. Add pimentón and chilli and cook. Put reduced tomato juice in bowl and add a little sherry vinegar and oil and pinch of salt. Liquidise the cooked tomato sauce and add the tomato juice and a drop of vinegar. Heat sauce in a pan with some chopped rosemary. Transfer potatoes to serving bowl and pour tomato sauce over. Add a little Ali Oli (garlic mayonnaise) at table. Method: Peel and fry potatoes and set to one side. Heat olive oil in a frying pan and add chopped onion, tomatoes,garlic and rosemary. Add pimentón and chilli and cook until sauce thickens. Liquidise and return to frying pan. Reheat sauce pour over fried potatoes. Pimentón[/glossary] is as essential to Spanish cooking as garlic and adds a wonderful smoky flavour to all sorts of dishes from stews to eggs. It’s a handy store cupboard standby which I also use to add a depth of flavour to tomato sauces and pan fried potatoes. Pimentón is available either as sweet or hot and both are equally great tasting additions to many dishes. Nowadays it is stocked in most supermarkets in the UK. This entry was posted in All Recipes, Vegetarian and tagged chilli, cooking on a shoestring, easy, hot, Mediterranean diet, party, pimenton, potatoes, Spanish, tomatoes by dontburntheonions. Bookmark the permalink. 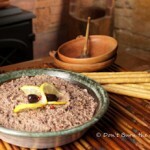 This recipe looks delicious I will book mark it and definitely try it.It was good to meet you at Bloggers Summit.